But it is along with 2 million others (1% of 200 million members). I used to be, according to some, ‘one in a million’. Now I have slipped to one in TWO million. it would say “Must try harder!”. But, then, it always did! And, that is my take on the ‘Top’ One Percent…… try harder. I agree, Brian. Good perspective and advice. An important distinction worth noting is that one IN a million is much different than one OF a million…or two million in this case. The latter is much less special. That said, nobody in the Top 1 or 5 is upset to be there. 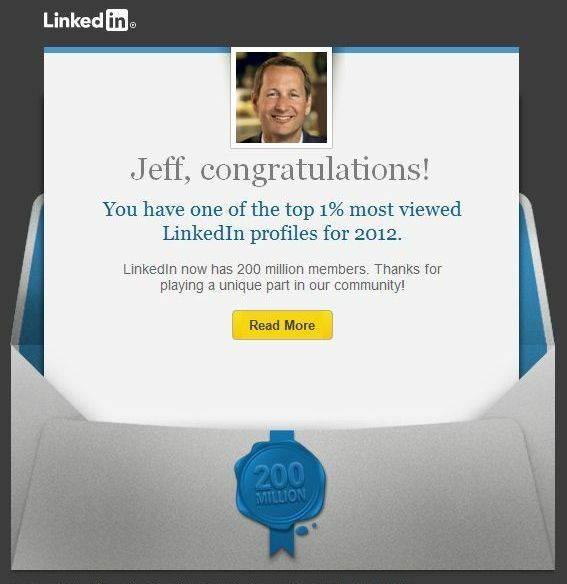 It was a good marketing move on LinkedIn’s part. It’s a hot topic right now.